Conventional wisdom says that Floyd closes down after Christmas, but the recent warm weather has brought more tourists down the Blue Ridge Parkway than anyone expected. We may still have a few more weeks before the town begins its annual hibernation for repairs and revitalization. For those who are new to Floyd, I have created a website which contains my articles on the fine food and entertainment that you can find in Floyd. 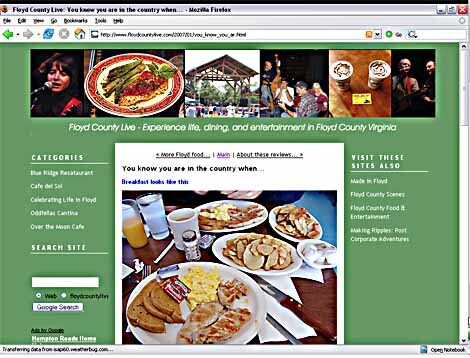 In this Floyd County Food & Entertainment website, you will find pictures and stories of many places Gretchen and I have personally visited and can recommend to visitors. I still have a few more sites to add, so don’t be concerned if your favorite establishment does not appear on the site yet. Bookmark this website and send it to your friends so that when the weather warms up and the roads to Floyd open again in the Spring, they will have all of the food news in one place. The link also appears in the right sidebar under Other Useful Sites. UPDATE:For those who enjoy late breaking news, Doug Thompson has the latest scoop on which venues are closed as of today. Read his article Not This Month.